After an armistice of seventy days, Paris again took up the struggle for France single-handed. It was no longer the territory only which she strove for, but the very ground-work of the nation. Victorious, her victory would not be sterile like those of the battlefield; regenerated, the people would set to the great work of remaking the social edifice; vanquished, all liberty would be quenched, the bourgeoisie turn its whips into scorpions, and a generation glide into the grave. For the third time since the 18th March Paris had but one soul. The official despatches, the hireling journalists established at Versailles, pictured her as the pandemonium of all the black-legs of Europe, recounted the thefts, the arrests en masse, the endless orgies, detailed sums and names. According to them, honest women no longer dared venture into the streets; 1,500,000 persons oppressed by 20,000 ruffians were offering up ardent prayers for Versailles. But the traveller running the risk of a visit to Paris, found the streets and boulevards tranquil, presenting their usual aspect. The pillagers had only pillaged the guillotine, solemnly burnt before the mairie of the eleventh arrondissement. From all quarters the same murmur of execration rose against the assassination of the prisoners and the ignoble scenes at Versailles. The incoherence of the first acts of the Council was hardly noticed while the ferocity of the Versaillese was the topic of the day. Persons coming full of indignation against Paris, seeing this calm, this union of hearts, these wounded men crying Vive la Commune! these enthusiastic battalions — there Mont Valérien vomiting death, here men living as brothers  in a few hours caught the Parisian malady. It was a fever of faith, of blind devotion, and of hope — of hope above all. What rebellion had been thus armed? It was no longer a handful of desperate men fighting behind a few pavements, reduced to charging their muskets with slugs or stones. The Commune of 1871, much better armed than that of 1793, possessed at least 60,000 men, 200,000 muskets, 1,200 cannon, five forts; a precinct covering Montmartre, Belleville, the Panthéon overtowering the whole city, munitions enough to last for years, and milliards at her bidding. What else is wanted to conquer? Some revolutionary instinct. There was not a man at the Hôtel-de-Ville who did not boast of possessing it. The sitting of the 3rd April during the battle was stormy. Many loudly opposed this mad sortie. Lefrançais, indignant at having been deceived, withdrew from the Commission, which, called upon to explain, threw all the blame upon the generals. The friends of the latter took up their defence, demanded that news should be waited for. Soon the disastrous tidings were brought, and they could not hesitate any longer. For such a usurpation of authority there was but one atonement possible. Flourens and Duval had made it voluntarily. The others ought to have followed. Thus the dead would have been appeased, similar follies once for all cut short, and the authority of the Commune brought home to the most refractory. But the men at the Hôtel-de-Ville were not of such inflexibility. Many had fought, plotted together under the Empire, lived in the same prisons, identified the Revolution with their friends. And besides, the generals, were they alone guilty? So many battalions could not have bestirred themselves all the night without the Council being informed thereof. Though blind or deaf, they were none the less responsible. In order to be just they ought to have decimated themselves. They felt this, no doubt, and did not dare strike the generals. They might at least have dismissed them. They contented themselves with replacing them on the Executive Commission, and notified this measure most respectfully. The Commune was desirous to leave them all liberty in the conduct of the military operations; it was as far from wishing to disoblige them as from wishing to weaken their authority. And yet their heedlessness, their incapacity, had been mortal. Their ignorance only saved them from the suspicion of having betrayed. This indulgence was big with promises for the future. This future meant Cluseret. From the first days he had beset the Central Committee, the Ministries, in quest of a generalship, his hands full of war plans against the mayors. The Committee would have nothing to do with him. He then clung to the Executive Commission, which on the 2nd April, at seven o'clock in the evening, appointed him delegate at war, with the order to enter upon his duties immediately. The rappel was being beaten at that moment for the fatal sortie. Cluseret took good care not to take possession of his post, allowed the generals to ruin themselves, and on the 3rd appeared before the Council to denounce their childishness. It was this military pamphlet-monger, with no pledge but the decoration he had won against the Socialists of 1848, who had played the marionette in three insurrections, whom the Socialists of 1871 charged with the defence of their Revolution. The choice was execrable, the very idea of naming a delegate faulty. The Council had just decided to keep on the defensive. To guard the lines, regularize the services, provision and administer the battalions, the best delegate would have been common sense. A commission, composed of a few active and laborious men, would have offered all guarantees of security. Moreover, the Council failed to point out what sort of defence they had in view. The defence of the forts, of the redoubts, of the accessory positions, required thousands of men, experienced officers, a war with the mattock as well as the musket. The National Guard was not qualified for such soldiership. Behind the ramparts, on the contrary, it became invincible. It would have sufficed to blow up the forts of the south, to fortify Monmartre, the Panthéon, and the Buttes-Chaumont, to strongly arm the ramparts, to create a second, a third enceinte, to render Paris inaccessible or untenable to the enemy. The Council did not indicate either of these systems, but allowed its delegates to dabble with the two, and finally annulled the one by the other. The Committee certainly declared in another proclamation that it did not pretend to any political power, but power in times of revolution of itself belongs to those who define it. For eight days the Council had not known how to interpret the Commune, and its whole baggage consisted in two insignificant decrees. The Central Committee, on the contrary, very distinctly set forth the character of this contest, that had become a social one and, breaking through the political facade, pointed out behind the struggle for municipal liberties the question of the proletariat. The Council might have profited by the lesson, endorsed if necessary that manifesto, and then, referring to the protestations of the Committee, obliged it to dissolve itself. This was all the more easy in that the Committee, much weakened by the elections, only existed thanks to four or five members and its eloquent mouthpiece, Moreau. But the Council contented itself with mildly protesting at the sitting of the 5th, and as usual letting things get along as best they could. It was already drifting from weakness to weakness; and yet, if ever it believed in its own energy it was that day. The savagery of the Versaillese, the assassination of the prisoners, of Flourens and Duval, had excited the most calm. They had been there full of life three days ago, these brave colleagues and friends. Their empty places seemed to cry out for vengeance. Well, then, since Versailles waged a war of cannibals, they would answer an eye for an eye, a tooth for a tooth. Besides, if the Council did not act, the people, it was said, would perhaps revenge themselves, and more terribly. They decreed that any one accused of complicity with Versailles would be judged within forty-eight hours, and if guilty, retained as a hostage. 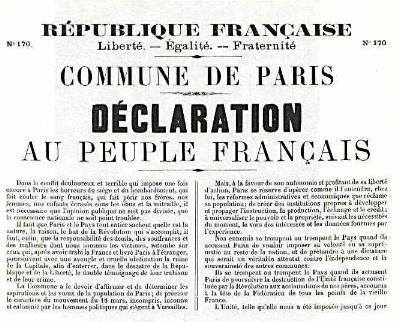 The execution by Versailles of a defender of the Commune would be followed by that of a hostage — by three said the decree, in equal or double number said the proclamation. These different readings betrayed the troubled state of their minds. The Council alone believed it had frightened Versailles. The bourgeois journals certainly shouted Abomination! and M. Thiers, who shot without any decrees, denounced the ferocity of the Commune. At bottom they all laughed in their sleeves. The reactionaries of any mark had long since fled; there only remained in Paris the small fry and a few isolated men, whom, if needs be, Versailles was ready to sacrifice. The members of the Council, in their childish impetuosity, had not seen the real hostages staring them in the face — the bank, the civil register, the domains and the suitors fund. These were the tender points by which to hold the bourgeoisie. Without risking a single man, the Commune had only to stretch out its hand and bid Versailles negotiate or commit suicide. The timid delegates of the 26th March were not the men to dare this. In allowing the Versaillese army to march off, the Central Committee had committed a heavy fault; that of the Council was incomparably more damaging. All serious rebels have commenced by seizing upon the sinews of the enemy — the treasury. The Council of the Commune was the only revolutionary Government that refused to so so. While abolishing the budget of public worship, which was at Versailles, they bent their knees to the budget of the bourgeoisie, which was at their mercy. Then followed a scene of high comedy, if one could laugh at negligence that has caused so much bloodshed. Since the 19th March the governors of the bank lived like men condemned to death, every day expecting the execution of the treasure. Of removing it to Versailles they could not dream. It would have required sixty or eighty vans and an army corps. On the 23rd, its governor, Rouland, could no longer stand it, and fled. The deputy governor, De Ploeue, replaced him. From his first interview with the delegates of the Hôtel-de-Ville he had seen through their timidity, given battle, then seemed to soften, yielded little by little, and doled out his money franc by franc. The bank, which Versailles believed almost empty, contained: coin, 77 millions;  bank-notes, 166 millions; bills discounted, 899 millions; securities for advances made, 120 millions; bullion, 11 millions; jewels in deposit, 7 millions; public effects and other titles in deposit, 900 millions; that is, 2 milliards 180 million francs: 800 millions in bank-notes only required the signature of the cashier, a signature easily made. The Commune had then three milliards in its hands, of which over a milliard was realized, enough to buy all the generals and functionaries of Versailles; as hostages, 90,000 depositors of titles, and the two milliards in circulation whose guarantee lay in the coffers in the Rue de la Vrillière. Beslay, deeply moved, hurried off to the Executive Commission, repeated his lesson all the better that he believed it and prided himself on his financial lore. The bank, he said, is the fortune of the country: without it, no more industry, no more commerce. If you violate it, all its notes will be so much waste-paper. This trash circulated in the Hôtel-de-Ville, and the Proudhonists of the Council, forgetting that their master put the suppression of the bank at the head of his revolutionary programme, backed old Beslay. At Versailles itself, the capitalist stronghold had no more inveterate defenders than those of the Hôtel-de-Ville. If someone had at least proposed, Let us at least occupy the bank — but the Executive Commission had not the nerve to do this, and contented itself with commissioning Beslay. De Ploeuc received the good man with open arms, installed him in the nearest office, even persuading him to sleep at the bank, made him his hostage, and once more breathed freely. Thus from the first week the Assembly of the Hôtel-de-Ville showed itself weak towards the authors of the sortie, weak towards the Central Committee, weak towards the bank, trifling in its decrees, in the choice of its delegate to the War Office, without a military plan, without a programme, without general views, and indulging in desultory discussions. The Radicals who had remained in the Council saw whither it was drifting, and, not inclined to play the martyrs, they sent in their resignations. 0 Revolution! thou dost not await the well-timed day and hour. Thou comest suddenly, blind and fatal as the avalanche. The true soldier of the people accepts the combat wherever hazard may place him. Blunders, defections, compromising companions do not dishearten him. Though certain of defeat, he struggles still; his victory looms in the future.